Cold has finally conquered North Texas! For several days now, wind has been blowing harder and it feels colder when hits the skin. My winter clothes are now back in the closet. They are hang now so they could back me up in the cold. Just lately, we already reached freezing points in some areas in greater Dallas/Fort Worth area in North Texas. After experiencing the long months of Texas heat, colder temperature feels very soothing and relaxing as long as you are dressed accordingly to combat the cold. I guess the latter is the only trick to learn to love cold weather. Now that winter is getting closer, I already expect for a more windy and colder weather. This is the second day since I have difficulty opening Friendster. It takes several minutes before it downloads. Sometimes is is even unavailable or under maintenance. Tonight, after couple of attempts to open my Friendster account, I was surprised to see that I only have 14 friends in my list. Wow, how could it be when I didn't delete anyone from my approximately 250 friends in my list. I hope this is just a joke since most of the missing accounts in my list are either my high school or college classmates and boardmates. Oh, they are one of the very reason why I maintained a Friendster account. I want to keep in touch with them and Friendster is one of the most effective way to do it. I guess there is a bug in Friendster site. I hope I am correct and once this is corrected, I hope my Friendster list will be complete again. 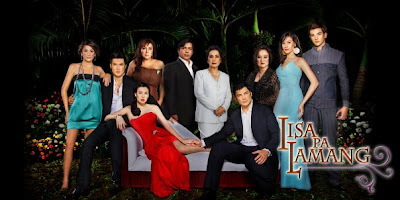 Dyosa is another Philippine drama series aired in ABS-CBN that I get hocked with these days. I love the combination of comedy, fantasy, drama and love stories that engulf Dyosa. The plot is very magical and great especially in Kabanuas (good engkantos like gods and goddesses) and Kasamyans (the evil engkantos like malignos). Dyosa feautures one of the famous Philippine folklore characters Mariang Sinukuan and Bernardo Carpio which are portray by Mickey Ferriols and Matthew Mendoza. This "fantaserye" showcases the very talented young stars of today's generation: Takda (Choosen One): Anne Curtis (a.k.a Josephine, Josie); Villain Beast: Sam Milby (Adonis); Takda's Childhood friend and Protector: Luis Manzano (Kulas) and Dyosa comics Illusionist/Illustrator: Zanjo Marudo (Mars). The powerful casts also includes Jaclyn Jose (Magayon: sister of Mariang Sinukuan), Nikki Bacolod (Diana: Takda's half-sister), Epi Cuizon (Bakus: Half goat/Half man), Llyod Samartino (Amang Suga) and many more. 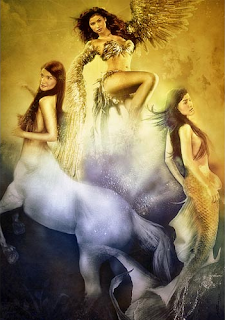 Anne Curtis, Dyosa, transforms into three personas (mythical creatures) in this drama series: Mermaid (half-fish), a Centauride (half-horse), and a Siren (half-bird). However, Dyosa is reluctant in doing her role as Takda (Choosen One) of the Kabanuas. She is caught in the dilemma of leaving her life in the mortal world for 18 years or go back to Kabanua and be crowned as Takda. Sam Milby, Adonis, the villain beast from Kasamyan was sent to the mortal world by his father Kadaklan to kill Takda but when he laid his eyes on her he has having thoughts of doing what he was told to do because he slowly fall in love with her. Diana, half-sister of Takda, followed Takda in the mortal world because she wants also to kill her so she will be crown as Takda and not her sister. Magayon, Diana's mother and Mariang Sinukuan's sister, was helping Diana to kill Takda. But the plan of Magayon and Diana to kill Takda is getting difficult since Adonis is closely watching over Dyosa protecting her from all harm around her. The story is getting more and more intense and nicer everyday. Oh, I love these drama series so much aside from the fact that Anne Curtis is one of my fave young actresses. Do you? I am sure when you are resting or when you are chilling out in your hotel room, the very least sound that you want to hear is the fire alarm. The same idea goes for the hotel staffs; hearing the fire alarm means a big hassle in our part since we have to make sure that we handle the situation base on the hotel's SOP aside from the fact that we have the tendency to face a lot of angry guests and bombarded with a non-stop calls. The presence of the fire department who are deployed by the city to check on the alarm that they received is not fun at all. Unfortunately, even if we will call them and let them know it was only a false alarm they still have to go to the hotel, check the location that triggers the alarm system to went off and re-set the fire alarm system. Just an FYI, the hotel staff are only allowed to silence the alarm once we confirmed that it was only a false alarm and no danger awaits for our guests; however, it is only the fire department personnel who is allowed to re-set it. I know it is annoying to everyone seeing the lights flashing in every corner of the hotel while waiting for the fire department to arrive but everyone should understand that those will stop only once the system is re-set. Just two nights ago, the fire alarm system in our hotel went off. Everyone was going crazy going out from the hotel. Thanks God! It was only a false alarm. All our rooms are suites so they have microwave in their rooms. Someone was making popcorn while he was using the bathroom. The popcorn got burn and it produces smoke which triggers the whole fire alarm system of the hotel to sound. Dang! You are right! It was no fun at all especially that there were only few hotel staff left. Some have to go outside and informed the guests that it is safe to come back to their room in case they didn't hear my announcement over the speaker. I also need to check all the exit doors of the hotel just to double check if there are no guests still waiting there for any feedback from us. Lastly, I need to walk around to each floor levels to make sure everything is okay especially the elevators. Oh, I didn't a lot of things just to check that everything is back to normal. See? This is what I am talking about. Geez.. I wish I can explain more how hassle it is to both guests and hotel staffs. So, my verdict is... Don't cook something in your hotel room when you aren't around to see what is going on!!!! I am off today! Yahooo!!! Finally, I got the chance to enjoy the silence and the comfort of our home. I must say, it is really different to wake up in the morning without the fear or worries to be late in going to work. Oh, I love the temperature today. I can truly feel the Fall weather. Now, we can save from our electric bill since we are not using our AC already. The weather is just so beautiful that there is no need for extra coldness. I will spend my time today to clean the house, take care of my blogs and to arrange our storage. I also need to put some stuff in our storage. I saw some things in the kitchen that we aren't using anymore so I decided to take them to the storage. Everyone, I will see you later in my blogs. Enjoy your day!!! Let's Exchange Links, Leave a Comment In this Post! I am not so sure if you have notice it but no matter where you go in this blog you won't see any list of blog URLs that I posted here from exchange links. You will only see the links of the blog I authored and my hubby's blog. I intentionally did this. I want that when I will start exchanging links my blog is already in my own domain name. In this way, I will avoid the hassle of asking the bloggers I exchange links with to update my blog URL. Today, I was able to set up my own domain for this blog. Hence, I would like to let everyone knows that I am formally accepting link exchange requests. Please leave a short comment in this post if you would like to exchange links with me. Hope to see you all here. I just arrived in the house from work. In fact, when I stepped out from the hotel, I can still see the orange sky right at where the sun rise. I was surprised that the street was so quiet. I was expecting for a heavy traffic but it wasn't. Thanks God or else it would have take more time to go home. I took some picture of the sky. It was so beautiful! This morning, I can very much feel the cold breeze that keeps on blowing onto my skin. It was very relaxing and it makes me more sleepy. Oh, yeah, I am happy that I feel sleepy at this time. Yesterday, I had a very difficult time falling asleep. Oh, I have to end here. I need to go to sleep. I know I am so blessed with the way my career (work) is heading. After 6 months in that company, I was given the opportunity to step up. It doesn't happen all the time; most of all it doesn't happen to everyone that is why I considered myself fortunate. My superiors are cool and very professional. I have no claim against them. However, my schedule is getting so much crazy every now and then. Well, part of my promotion is working different shifts depending on the situation. At first I love the new position. Who won't when you achieve one step higher, right? However, my fondness is slowly depreciating as the demand from work and my schedule are getting crazier. I find it no fun already. Now, I am thinking of looking for another work. I am thinking to stick with the hospitality industry but I would not like to be working as the hotel's frontliner. Oh, frontliner is the term I gave with the front desk department. This work requires more patience; you need to be resilient. No matter how tired and pissed you are, in front of the guest you still need to be sweet, smiling and very accommodating. Yeah, I know, you have to pretend; in Filipino "plastikan ang show". Some of my friends and even my husband always tell me that I will have more opportunity for growth if I will stay in this company. Yes, we are very much pampered with wonderful benefits in this company. I can't complain in that matter. We have all the insurances and 401K which is very important especially the latter for my retirement days. Anyway, I am not yet in a hurry to leave my post but I am also looking around and my door is open for whatever greater opportunity that will come my way. My 4th blogger baby is born. Yes, after days of contemplating as to whether I am going to launch this blog or not, I finally decided to give blogging a 4th try. I know I don't have a lot of time to take care all of my blogs everyday but somehow I can't help myself to expound my horizon in the blogosphere.